My english isn´t perfect and my technical english is even worse sorry for that. The definition of the sag is correct. In my opinion the DDC is pretty poor. Both my other bikes with properly sorted normal suspension are much better. I still love the bike though and it's probably better than most standard set ups. No problem, just wanted to make sure I understood correctly, and that we were not 'barking un the wrong tree'. Having said that, the OP definitely has something dodgy going on, and his dealer should really have more knowledge! This is a very confusing thread. Since when do you adjust the dampers to set the sag? I saw where there seemed to be a change between setting the sag to having a damper issue, but I'm still not convinced that everyone on this thread understands the difference. Hence why I posted what I posted. I believe the OP is have damping issues, but clouded the fact by going on about trying to stiffen it up by adjusting the pre-load (and hence setting the SAG). Again, pre-load adjusts the SAG so that the shock operates in it's optimum 'range'. Damping is adjusted by the DDC setting soft/normal/hard. It would appear the dealer was adjusting the sag in the first instance but an issue with the damping adjustment not working on the front has arison as they were working on it..
What will be a little confusing is the OP has changed the title of the thread from Sag adjustment problem to Damping adjustment problem. Its why the previous two posts have Damping adjustment problem in the header, but if you read from the 2nd post it states Sag adjustment problem. OP admits his technical english is not so good, so bear that in mind when reading through. Perhaps so. The sag setting is the starting point. Damping is totally electronically controlled and there is no manual adjustment for it. In fact, once the front sag ( and rear ) is set the damping for front & rear is controlled by the rear trailing arm height sensor & the ECU. It would be very strange for the rear shock to be working properly and the front forks to be noodles. If everything is really & truly set properly the front should be good automatically. If not then there is an ECU problem, a wiring problem, or a very bad mechanical problem in the front. Indeed yes, aside from the pillion or "heavy load" electric adjustment on the rear. Preload settings for sag are a mechanical adjustment. I think some information may be lost in translation between OP, dealer anf us. Indeed if you wound the preload adjusters right out to minimum, set the rear preload setting to one person, then set the damping to soft one would expect a longer quicker moving suspension action if you pushed down on the bike and let it return (ignition on). If the damping was set to hard, there should be a noticable slowing of the suspension travel. This would be what I would do to test damping is working. If it is, then back to the start and set sag as per manual and then selectndamping to suit your mood. The bike was working properly when i took it to the dealer. After reading a few posts in this forum i realized that adjusting the bike to your own weight makes a whole lot of diference on bike behaviour - for the better. So i took the bike to the dealer and i took the owner manual with me in case the mechanic didn´t knew what to do. Guess what he never done that on bike with DDC. Where i live this is the only S1000R and the RR around me didn´t bother with that adjustment. He adjusted the rear just fine. When he got to the front the bike become soft after a few turns on the screw. Didn´t like it and it wasn´t it the right measure for my weight. He then tried to stiffen the suspension by moving the screw in the opposite direction. Nothing moved, the bike kept soft no matter the direction he turned the screw - even on it´s full range - no change whatsoever. Computer diagnostics say everything working properly. Sorry guys if i said anything confusing, i try my best not to :) and thanks for trying to help. No worries, always happy to try and helpna fellow motorcyclist. When you describe the front as "soft" are you refering to how low the front is sitting on the springs? As I mentioned before, if a Ziptie was tied to the lower tube loosely would the fork stantion push this ziptie to the bottom easily when riding. Ignore the electronic damping adjustment for the moment. I think there is some confusion with the term soft being connected in our minds with damping which it usually is when talking suspension. 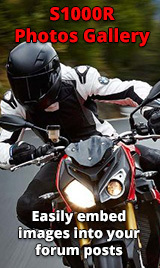 Would I be correct in thinking when you say the front is "soft" you are referring to how low the front forks sit when you are on the bike and riding?